Fused quartz sand grains. Typically white or gray, although other pale colors are common; rarely a darker color. 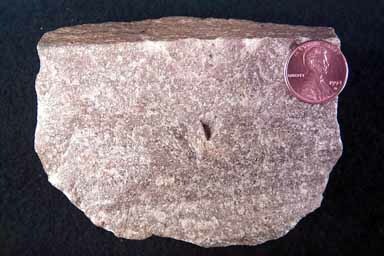 This is a typical quartzite. They are dense, hard rocks, generally uniform in texture, composed of fused quartz sand grains. Often they rock has a granular appearance on a weathered surface, but along a broken surface the sand grains are usually split. Also, unlike most of the nondescript rocks, quartzite has a glassy luster. Quartzite results from the almost any metamorphism of a quartz sandstone, and as such have no specific tectonic association or meaning. They can form just about anywhere. Mostly the result of Barrovian or contact metamorphism.